How many people has climate lured to the Southland? Idyllic images of a sun-drenched region—packaged into travel narratives, citrus crate labels, and surf-rock songs—attracted millions to the Los Angeles area. As early as the 1870s, tubercular invalids were moving to the region for its dry air and mild temperatures. Weather has been an essential part of the booster message ever since. And yet, reality seems to confirm the promotional claims. Ocean breezes temper the heat of summer and the cold of winter. Imposing inland mountains shelter the region from the extreme weather patterns of the continental interior. And a high-pressure ridge that reliably parks itself above the Pacific each spring keeps the Southland sunny and dry in summer. How good is L.A.'s weather? Consider that Dodger Stadium last endured a rainout on April 17, 2000—and rain has never canceled a game there during the months of June and July, when dark clouds often menace East Coast ballparks. Yes, L.A.'s weather is nearly perfect—except when it isn't. Santa Ana winds blow hot in the fall. In winter sporadic yet intense Pacific storms threaten to overwhelm the Southland's colossal flood control system. And tornados form over Los Angeles with same frequency seen in the Great Plains; Mike Davis devoted an entire chapter of his book Ecology of Fear to "Our Secret Kansas." But the most disruptive or destructive weather phenomena may be the ones Southern California's don't expect. Thanks to the Pacific's moderating influence, temperatures rarely drop below freezing in the region's lowlands. Though most precipitation there begins its descent from the clouds as snow, as it falls it will almost inevitably encounter air warmed by 55-degree ocean waters, melting into drops of liquid rain. No storm has incited as much wintry chaos as a 1949 system that lingered for three days and dropped several inches of snow on the lowlands. Icy conditions forced the CHP to close the Pacific Coast Highway. White powder dusted the tops of palm trees from Santa Monica to Laguna Beach. The Southern California Gas Company reported record demand as nighttime lows dipped into the 20s and furnaces blazed around the clock. Even more rare than snow are tropical storms, which usually lose their punch when they encounter the cool coastal waters of the California Current. Occasionally the moist remnants of a storm will sneak through Arizona or the Gulf of California. But if it moves fast enough, and if the sea surface temperatures reach a threshold of about 75 degrees Fahrenheit, a tropical cyclone can theoretically bring its fury to the Southland. On September 25, 1939, one such perfect storm passed over Catalina Island and collided with the coast of Long Beach. 72-mph gusts tore through the region as the storm dumped a record 5.62 inches of rain on downtown Los Angeles, flooding large parts of the region and causing $2 million in property damage. The storm's impact was worsened by the fact that it followed the more predictable weather conditions associated with the offshore Santa Ana winds. Caught off guard by the gale-force winds and heavy seas, 45 boaters perished at sea, many of them fleeing Catalina for the mainland. Dozens more died on land, bringing the death toll close to 100. Classed as a mere tropical storm, the 1939 system was the only cyclone to make landfall in California in the twentieth century. For a time, meteorologists doubted that a true hurricane (a cyclone with sustained winds of at least 64 knots) could ever reach the Southland. But recently, researchers at the National Oceanic and Atmospheric Administration reached into the historical record and showed that such storms are a real (if statistically unlikely) threat. Consulting folk accounts, military weather readings, and historical newspaper accounts, Michael Chenoweth and Christopher Landsea rediscovered a hurricane that ravaged the Southern California coast on October 2, 1858. In an age before satellite images or even weather balloons, the storm took the Southland by surprise. The keeper of San Diego's tide gauge was the first to notice it when his barometer plummeted several degrees below the record low. Then, hurricane-force winds of up to 75 mph sprang up from the southeast. "The whole heavens seemed closing in with bank upon bank of dark, heavy, ominous-looking clouds," reported the Daily Alta California. Ships dragged their anchors in the heavy seas and beached themselves on shore. Powerful gusts blew down houses and uprooted trees. The hurricane skirted San Diego and followed the coast north to Los Angeles, where it dumped torrential rains and ravaged the city's harbor at San Pedro. But the tempest was already dying; it dissipated shortly after reaching Los Angeles, the relatively cool coastal waters soothing its rage. Southland is made possible by a partnership between Gizmodo, the USC Libraries, and the member collections of L.A. as Subject. Written by Nathan Masters, the series explores the urban past of Los Angeles, including the lost landscapes and forgotten infrastructures that continue to influence the city we know today. 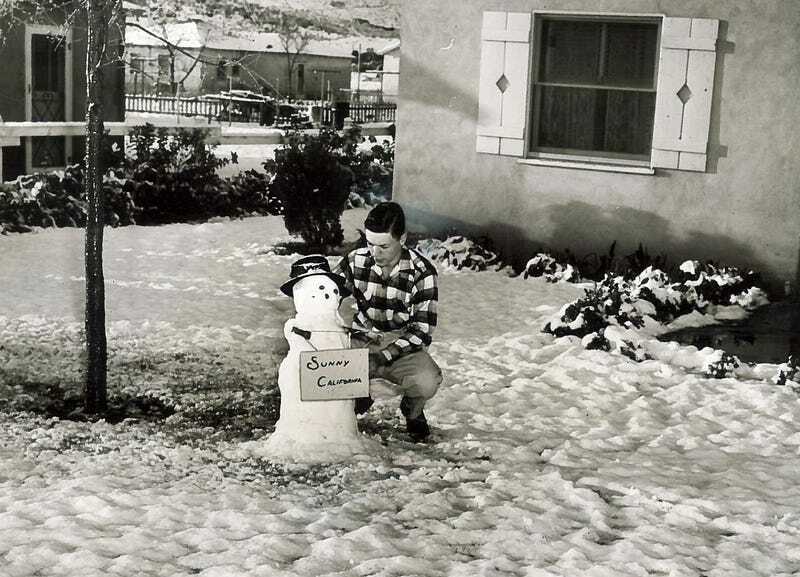 This post previously appeared in a different version on KCET.org as "Snow in the Basin: Documenting the Extremes of SoCal Weather."